Pizza Face Bento, a photo by sherimiya ♥ on Flickr. Look at those luscious lips! Okay, you might need a bit of imagination to see it, but there are supposed to be tomato eyes and red pepper lips on this cheesy, salami, arugula flatbread pizza. I used Mediterranean whole grain flat bread, which is thick enough to stand up to toppings, but which bakes crispy for a cool mini pizza. The other sections of this Sistema double-sided box contain Okinawan sweet potato, corn on the cob, pluots, nectarines, strawberries and blackberries. Smooch! I see the face! Do you buy the mediterranean flatbread already prepared? I love those berries, I had lots of them with my lunch today. Yes, it's (oops) actually Middle Eastern flatbread from Trader Joe's. I love it! hehehe I like the lips!! Gosh I love that you post every day a new idea! Lunch can become so boring. I am enjoying your creative ideas. Oh wow! Yummy! Your pizza's got lips like Mick Jagger.. : ) Funny, we're off for a pizza dinner tonight! Have a super weekend Sheri and friends..
Lol! That face cracked me up! I love it! I love the fruit and veg side. Everything looks so bright and fresh. The flatbread pizza is brilliant! Thanks a lot Jana, Lia, Nami, Chantal, Heather, AikoVenus! 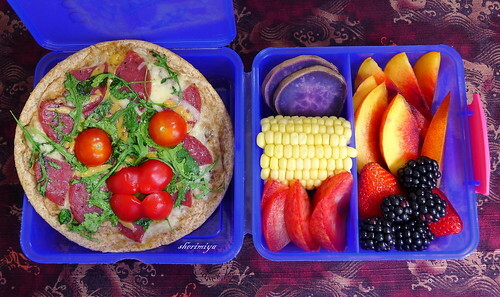 if my mummy made that i know id be eating lunch :) i;d prob be obese! 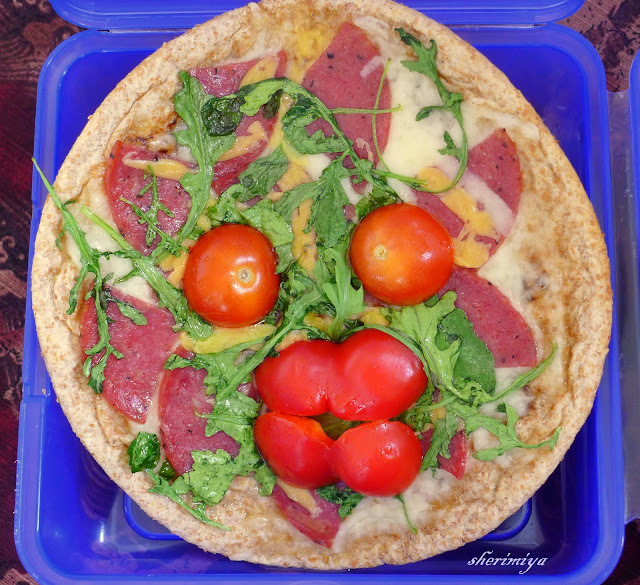 Love this idea I have to try pizza with veggie face, that should help my kiddo eat her veg! Wonderfully vibrant and so fun! I just love the indigo and violet colors with gorgeous fruits...a feast for the eyes!! You're so sweet as always Jenn; thank you! Oh, I love him. And I love seeing that Sistema box in use. I've seen it in the store before but have been leary of it. Very cool. Thanks Jenn; it's a cool box although you really can use it only with certain foods. I've only packed pizza, calzone, and big sandwich. But it's fun.